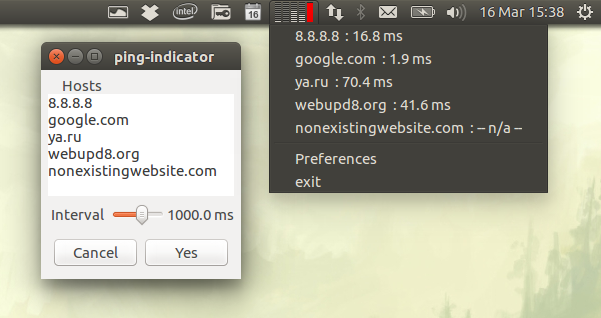 Ping Indicator is an AppIndicator created as a replacement for the old Link Monitor GNOME 2 panel applet. The application "pings" a given set of hosts (with configurable ping interval) and monitors the response time with logarithmic scale, displaying the results in the indicator menu. For each host, the app shows the response time as a graph in the AppIndicator icon. On packet losses, the graph turns red, as you can see in the screenshot above, for the latest entry, which doesn't exist. Note: Ping Indicator doesn't come with a .desktop file, so it doesn't show up in the menu. To launch it, either use "Run Command" (Alt + F2) or a terminal and type: "ping-indicator" (without the quotes).